Are you looking for family-friendly hiking in the Denver area? Have you wondered where you can bring your jogging stroller on a moderate run? Published in February 2014, this 120-page guide book contains the best family-tested trails in & around Denver, complete with detailed information on distance, elevation, trail width & surface, and other useful tidbits. All routes are soft surface trails wide enough for the whole family! 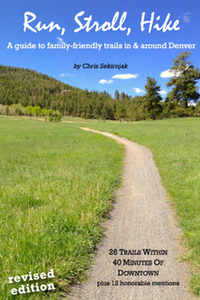 Update June 2015: After repeated requests from readers of Run, Stroll, Hike, I have made the book available as an iPhone app. The app goes beyond the scope of the book and I will keep adding trails to it. "This guide beckons active parents to run, stroll, hike or bike together with their kids (and dogs) while breathing clean air and taking in the sights, sounds, and smells of nature, away from concrete and pavement."